COD: 1374. Categoria: Action Figures. Each highly articulated human figure features the likeness of the actor and come with multiple accessories. Each walker features an amazing attention to detail and unique play-action for maximum fun! 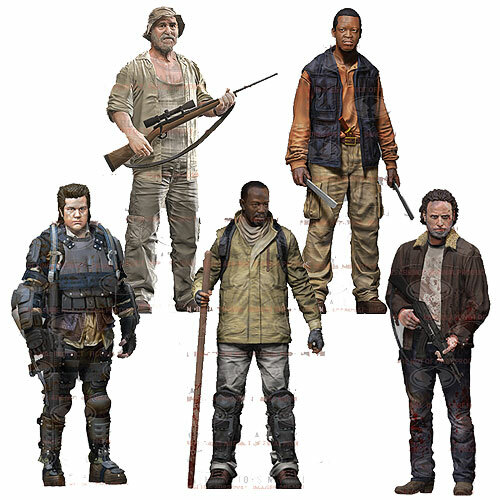 MORGAN JONES – A true survivor, Morgan has battled the apocalypse almost entirely on his own. After losing his family to the outbreak and almost losing himself in the process, Morgan has sought redemption by slaying the endless Walkers on his quest to find Rick Grimes. This version of Morgan depicts the survivalist in his battle ready armor and equipped with his favorite Walker dispatching weapons. Figure comes with approximately 22 points of articulation, assault rifle, alternate masked head, removable hood, walking stick, and backpack.